Sometimes I struggle with what direction to take with my blog. My blog is called “Becoming a sailor”. But, what does that mean? Do I write about the slow uptake of me learning to sail? That I fear sharks as I clean the hull with a scrub brush? Or, do I write of the places we visit – by sailboat? Lorraine (that’s me) shouted the course, cursed, and spat as salt enveloped and stung her face. The sea spray hammered SV Aphrodite. A lone figure, silhouetted against the inky abyss, put in another reef, as the mast tilted to and fro. They worked quickly, dodging the boom as they went. And then, just as soon as the storm came, it went. The sky cleared, the darkness was behind them, and they felt a stiff breeze. The storm was over. With that fictitious seafaring drama behind me, I shall move on to real life. As a matter of fact, I have just learned to reef a sail – in benign conditions. That means I can tie down the sail to make the sail shorter if need be, and I can secure other lines to make the sail maintain its shape. At the helm, I am learning to steer into the wind to stay a course while my husband raises the sail. Practice makes perfect, I guess. To catch up, we have now sailed from West Bay, New Providence Island to the Northern Exumas. And, we have had a visitor on board for the last few days. Our visitor’s name is Ewa, which is pronounced ‘Evva’. She is Canadian, originally from Poland, now lives in Switzerland, and is a friend of my dear friend and Blogger YukonJen. It has been great having Ewa aboard. 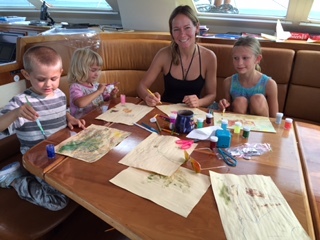 The kids love her, and it was nice to have someone else to help out with reading the seabed, and keeping a lookout for coral heads. Henry, Karen, Ewa and Betty at our saloon table. Ewa’s aim is to hitchhike – by boat – to Martinique, if possible. She will leave us soon when she meets up with the next suitable southbound boat. As I said, we are here in the Exumas (Bahamas) – Allan Cay – to be precise, where huge iguanas roam. They are as big as house cats. They bite occasionally, but four-year old Karen was enchanted by these seemingly prehistoric creatures. 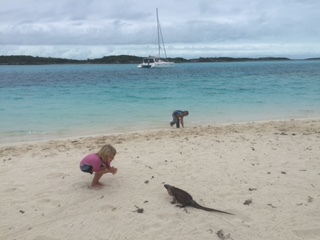 Karen (4) with a Bahamian Rock Iguana on Allan Cay. Henry (4) and our catamaran, SV Aphrodite, in the background. Yesterday the weather was perfect. We visited the beach and explored, what looked to be, an abandoned house. 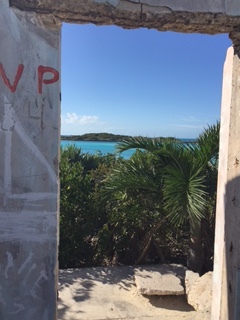 An (abandoned) room with a view, Allan Cay, Bahamas. VP was there. Jumping from our boat, Karen swam without her life jacket, and discovered seeing underwater with goggles for the first time. The underwater visibility was about 80 feet. Karen put her head underwater to see our propeller. Later, she tried diving down to touch the bottom with her dad. An ominous-looking stingray curtailed our swim. It seemed harmless enough – like a gothic cloak following the contours of the seabed. But, it was almost five feet across and, as it came within several feet of us while we swam, it certainly caused us a swift exit from the water. But today, we are indoors and the weather is much different. The waves are tall enough to crash over the narrow islands that surround us. Fortunately, we are in a protected area. Nevertheless we watched in the dark as neighboring sailboats repositioned their anchors by flashlight in the wee morning hours. This was no small feat as they battled the darkness, waves, current, and depth, not to mention other sailboats for a decent spot to anchor. It was quite something watching a silent orchestra of people – all working towards a similar goal – but in different boats. By 8 AM the winds had reached 40 knots. 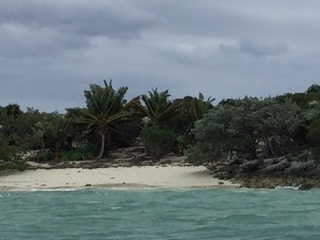 Palm trees being blown by high winds on Allan Cay, Bahamas. The winds continue to blow us about. But, we are monitoring our anchor placement with GPS. Rick and Seven-year old Paul swam to our anchor yesterday to ensure that it was properly placed. We are hugely grateful for our 105 pound Mantus anchor. As we waited out the storm, this morning, Rick radioed a Bahamian fishing boat called “Bout Time”. They arrived to the Allan Cay anchorage this morning. 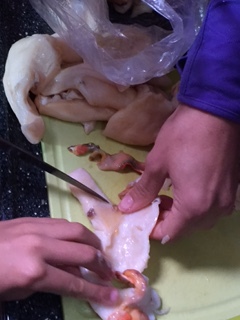 A few hours later they brought us 18 conch (pronounced ‘conk’) and some grouper filets. 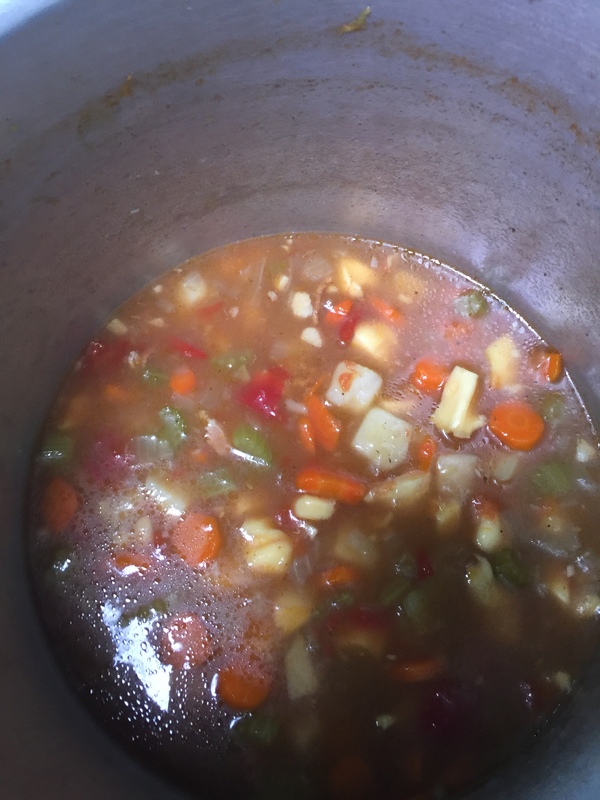 Ewa and Betty prepared the conch for a chowder we made this afternoon. We will continue to watch our surroundings, location and listening for our GPS alarms. Soon the weather will be nice enough that I can return to my job of cleaning the hulk of our boat. While I don’t fear sharks here, I really could do without that stingray. I’m jealous of your surroundings, but I’m glad I don’t have to haul up a 105 lb Mantus! Hi guys, all the way from Cebu Philippines, (Chateau By the Sea) reading your blog Lorraine is like next to being there. Sounds like all is well!! We enjoy reading your blog and hope to send some traffic your way. Hi again Lorraine…I’ve been reading the post and came across this one today. I’m in Cape Town now waiting for the new SF50 to arrive here from St Francis Bay. Anyway…what caught my attention was that you were scrubbing the hull. I want to tell you my experience cleaning a hull and a warning. Two years ago I help deliver a boat from Panama to the Galapagos Islands. The Ecuadorian Gov. is very serious about having a clean hull when you check into the GP Is.s . So, about twenty miles offshore we stopped the boat (65’cat) and four of us went over the side to scrub the hull. I fear sharks also and with all the green cloudy water from the cleaning, I was unintentionally trying to cling to the hull with my knees. There was lots of green algae and barnacles as the boat had began its journey in Florida. Now for the warning! Later that day I noticed a few scratches on my right knee and left arm which I concluded was from the barnacles. I , being stupid sometimes just let it go and did not think much about it. A week later I noticed some little clear bubbles on two of the scratches. I decided to put some medicine on them. The scratches on the arm had cleared up but these two just lingered on. I was in the Galapagos for two weeks and then flew home to Texas. The little scratches had grown twice in size to about an inch long, gaping and oozing….I went to the doctor and told him my LONG story and he gave me some ointment to put on it. I stayed in Texas for a month and all the time the scratches getting bigger and worse. I went back to he doctor and he gave me antibiotics and more ointment. I then flew back to my second home in Taiwan and over the next 6 months went to many different doctors before I found one that knew what was going on. The doctor had to actually take a sample of the tissue and send it to the lab to find out that I had a Mycobacterium Marinum Infection also known as Fish Tank infection. To try and make a long story short, after nine months and taking many bottles of antibiotics, which were making me sick to my stomach, I decided to have the tissue surgically removed. It took another month for that as the two infections were to close together to remove and then stitch up the wound. So, one had to heal and then the other one was removed. WARNING! Be careful cleaning your hull. Wear gloves and maybe even a wet suit if you have to swim while doing it. Also, and I know you will explain to the kids about this infection. I found out later that this bacterium resides comfortably in Florida and the Caribbean. That sounds nasty! None of the cruisers will enter the water here in the Luperon Harbour because it the water is so very murky – to be kind The visibility is probably about 2 feet. In the Dominican Republic my travel doctor tells me that we always need to put something between us and the ground. There are parasites that can enter your body here. That said, I only just learned this information today – my five year old twins sometimes stage writhing-on-the-ground protests, and we’ve never had any problems with bugs. Knock on wood. Let me know when the St Francis 50 arrives – if you can. I bet it will be beautiful.